Note from JParadisiRN: This post was originally published on this blog in 2011. As it remains one of my most popular, I dusted it off for you to read today. Happy New Year 2014! Every year I write my New Year’s resolutions on Post-It notes, filling a blue, vintageMason jar with them after reviewing the ones from the year before. I write the date on each Post-It note. 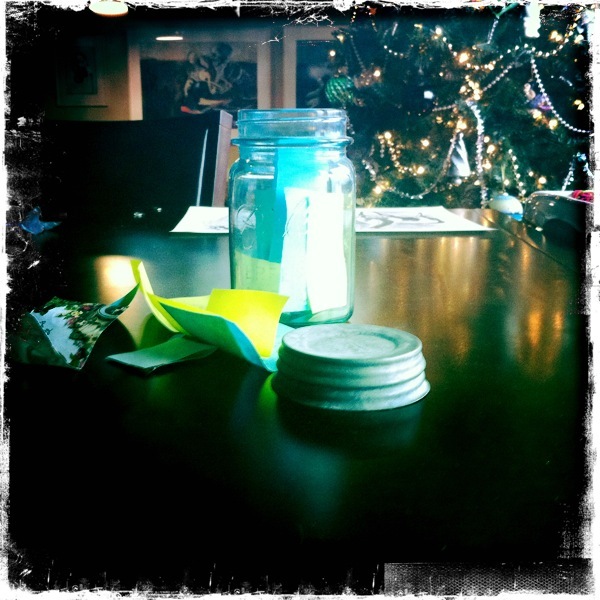 If a previous year’s resolution wasn’t met, and still holds merit, it remains in the Mason jar with the new ones. “The continued good health of our families” (1999) I updated this one to “our families” in 2004, the year David and I married. Gallery representation leads to the desire for critical recognition, increased sales, collectors, fame. Publishing stories leads to writing more stories, longer ones, for larger audiences. Health and happiness leads to the expectation for more of the same. I lost ten pounds last year. For 2012 I expect to keep them off. Resolution is the wrong choice of word. For me, setting New Year’s Goals is better phraseology. Most of the improvements I wish for in life take time and perseverance to achieve, and more hard work to maintain. To my way of thinking, New Year’s is a time to review the larger goals of my life, and see if they are still worth steering towards. If so, then I ask myself what small adjustments can I make this year to further them? These adjustments are written as goals on the Post-It notes, dated, and placed in the jar. A clean bill of health when we were afraid my cancer had returned. Editors who published my paintings, essays, and blog posts. David and I lost weight. He avoided a prescription for blood pressure medication. I was represented by Anka Gallery. I met wonderful people there and made lasting friendships. JParadisi RN blog has grown beyond my previous goals. So what’s on Post-It notes this year? What goals am I steering my life towards in 2012? I will continue to develop my skills as a nurse so my patients remain safe in my care. I will strive to be a better team player at work. I will phrase criticism in a constructive manner. I will remember that everyone has a difficult job. That’s why they call it work. I will say Thank You at least once daily. It’s wrong to wait an entire year to give thanks for everything that is good in my life. I wish to thank my family and friends (new and old) for your support of JParadisi RN blog. May your New Year be filled with Health, Love, Happiness, and Prosperity. I have met inspiring people through blogging. Special thanks to: Dr. Dean Burke, Joni Watson, Brittney, Sean, poet Stacy Nigliazzo, and artist Matt Lamb.